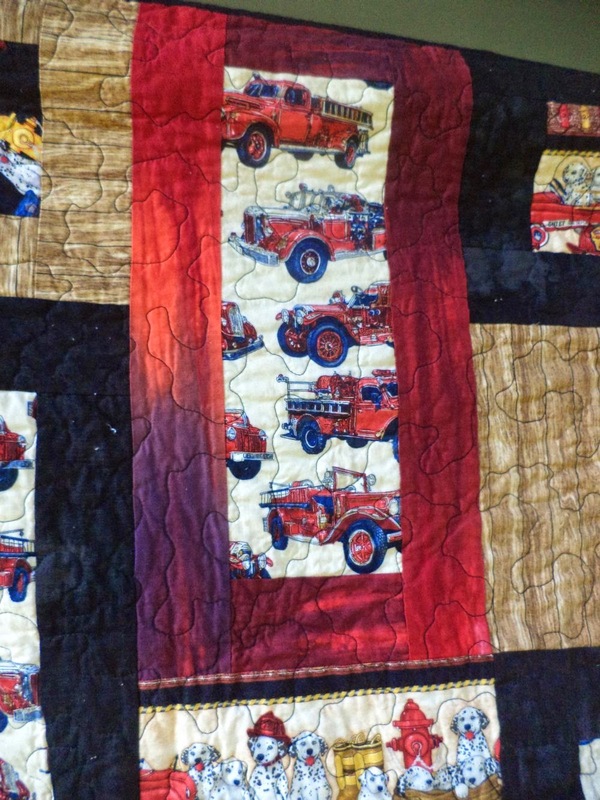 The "All Fired Up" quilt was a quick one--and it had to be. A friend got a devastating cancer diagnosis last Friday morning and began chemo that evening. He has been a firefighter for over 30 years! I saw the fireman fabrics at my LQS Saturday and knew that it was just meant to be. I delivered the quilt Tuesday to an emotional reception, on both sides. I didn't get very good pics because I finished it at night and was in a rush the next morning to deliver it. Cancer is a terrible disease. My friends have hardly even gotten over the shock of the diagnosis and are already in the thick of treatment. They're trying to keep it together for their 3 young children, but there's only so much a person can do. A quilt is a small thing in the face of all that. But I'm a quilter, and that's what we do. There are 3 focus fabrics, all from the "All Fired Up" Line from Dan Morris for RJR Fabrics. 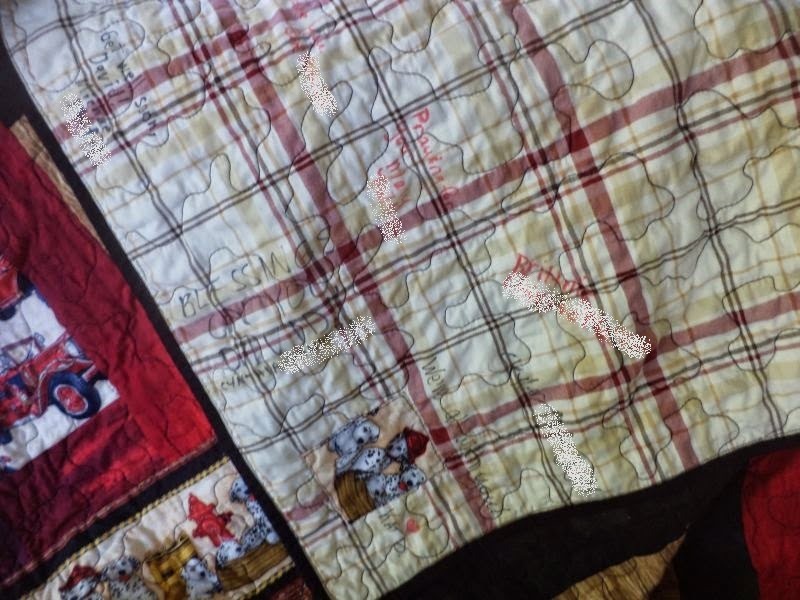 I used The Anna Quilt from Jibberish Designs to show off the large prints and mixed them with 3 neutrals-- a textured black, a tie-dye looking fiery red print and a wood grain. The top came together in about 4 hours. Another hour to baste. Then 4 more hours to quilt with a loose stipple and machine bind. I feel like I have reached a new milestone on quilting with this one, a finished bed-size quilt in 2 days (I worked Sunday, so it doesn't count) is a record for me. Now I know that I can speed quilt when I need to! I hand sewed a piece of the focus panel onto the back and signed it with a fabric marker. Before I even got the binding on I drove around town to a few friends of ours to get their signatures as well. I gifted the quilt along with a set of fabric markers so that every one who comes to visit can add their well wishes. 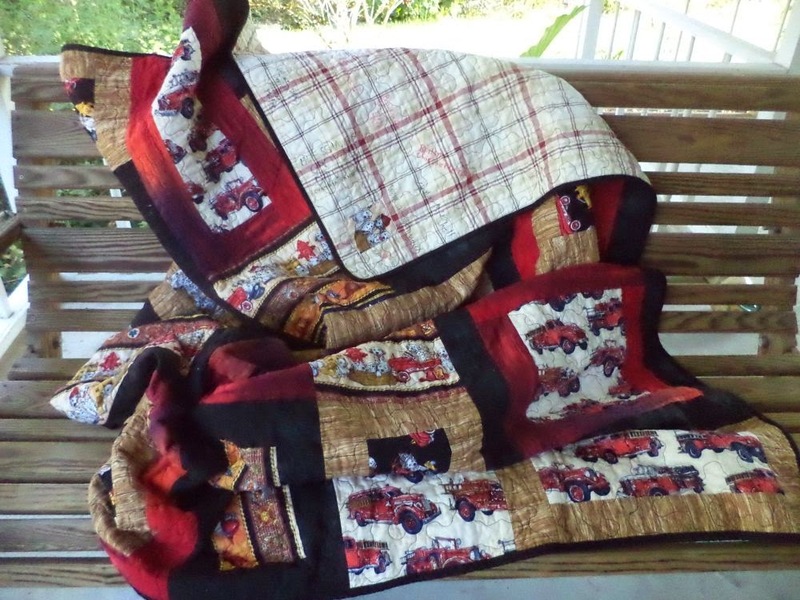 I promised the fireman's wife that when all this is over I will make them a nice quilt for their home, so there is no need to worry about this one getting "dirty". I hope that it winds up dirty and stained and washed until it falls apart! I am sorry for the need for a chemo quilt, but grateful to be able to provide some comfort. Because I'm a quilter and that's what we do. 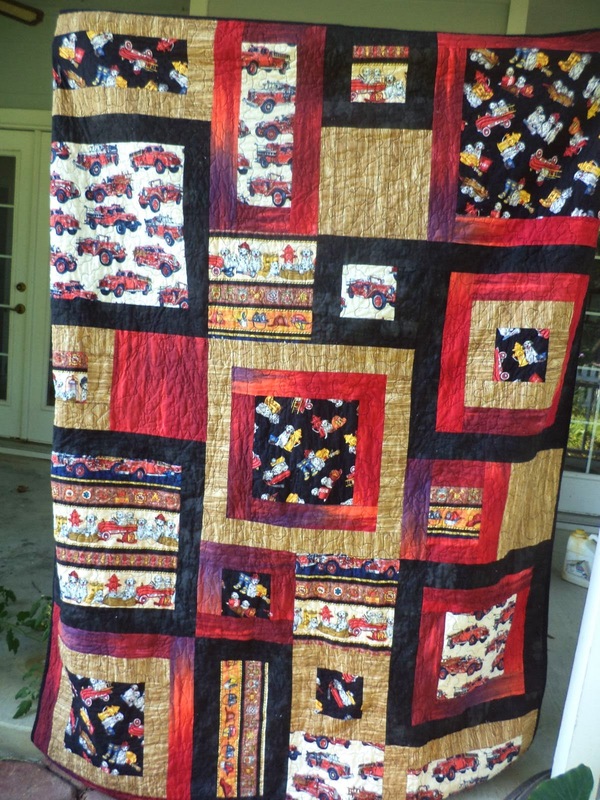 Linking up to Crazy Mom Quilts Finish it Friday. Fun fabrics. Congrats on your finish! Your story touched my heart. What a great ting to do! May the quilt bring much needed comfort. What a lovely gift. I know you have already been so generous, but if you have any fireman fabric left over, I imagine the kids would love a little security blanket to use when they are worried or away from daddy. Wow, what a great quilt and in so short a time. That makes the gift even more fitting that it is so timely. The encouragement to use this quilt supported by the promise of another quilt is so thoughtful. The quilt itself is a fantastic choice of colors and patterns that show off the fabric to its best. Just as you were speed with your gift I a speedy recovery for your friend. Your quilt resonated with me in another way. My son-in-law used to be a fireman. I have made him an assortment of pillowcases out of fireman fabrics. I always have my eye out for fabrics with that theme. What an awesome gift, I'm sure it will bring lots of comfort to him and his wife. I love the pattern and fabrics you chose. And such a speedy quilt. I will pray that your friend recovers and grows stronger from this process. I loved reading your 'little secrets'. :) You sound like my kind of quilter. 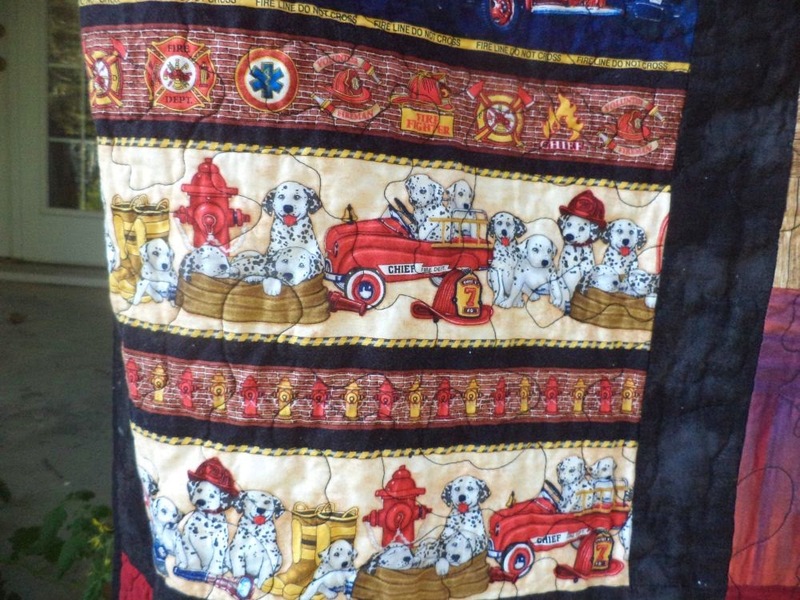 :) What a lovely gift you made your fireman quilt. And wow, did you ever get it made in record time! It always makes me so sad to hear about young people with children having to deal with such a harsh thing as cancer. I am looking for this fabric!! Can you tell me the shop name so I can try to order it?? Thanks!! A Very Busy Design Wall! Design Wall- Something different at last! Today in "Why is my Quilt so Heavy?" Pets on Quilts Show 2014!